Below you will find an alphabetical list of cooking, re-heating, freezing and jamming tips. These are listed according to the fruit, vegetable or food that is being used. There are tips on everything from freezing a Johnson’s PIES, roasting corn to making applesauce. Give them a try. If you have any recipe ideas we would love to here them. Send them to us at info[at]johnsonsfarm.com. Thanks and enjoy the HARVEST!!! Place chopped apples in medium sauce pan over medium/high heat. Add sugar and vanilla. Bring to a boil, reduce heat to low, cover and simmer for 15 minutes. At this point you can add dried fruit or nuts. Dried cranberries work real well and add a touch of color as well as tartness. Serve warm or cold. can be stored in an airtight container at room temperature for 3 days. Mix together first three ingredients in a large bowl until honey is dissolved. Combine remaining ingredients and add to dressing in bowl. Mix well and serve immediately. Preheat oven to 350 degrees. Grease and flour a 9” Bundt pan. Peel, core and chop apples into chunks. Toss with cinnamon and sugar and set aside. Nutritional information: Asparagus are one of only four vegetables high in vitamin E. It is also a source of vitamins C and A, as well as potassium, niacin and some iron. Asparagus are season in early spring; however you can find them year round. Look for spears w/tight buds and smooth skin. Asparagus should not be withered, brown or limp. Smaller spears are especially tender. To prepare Asparagus for eating/cooking, snap the stems where they naturally break to remove woody bottom portion. Steaming: place spears in pot w/½” of water, cover and cook on high for about 5-7 minutes. Microwave: place asparagus in covered dish w/a little water, microwave on high about 3-5 minutes. Make one yourself or buy it from our Bakery!!! Break off woody ends. Lay spears in single layer on baking sheet. Sprinkle w/garlic, and then drizzle w/olive oil. Bake for about 5-7 minutes or until spears look wrinkled and brown in some spots, shaking pan half through cooking time. Remove from heat, season w/salt and pepper to taste. Serve hot or at room temperature. Excellent topped w/glaze below. Simmer ¾ cup balsamic vinegar in small skillet over medium heat until it’s syrupy and has reduced to ¼ cup, 15- 20 minutes. Stir in ¼ cup extra virgin olive oil into balsamic vinegar and drizzled over roasted spears. In a large frypan over medium high heat melt butter and brown sugar together until dissolved. Add asparagus and sauté about 2 minutes. Stir in broth, bring to a boil, cover and simmer until just tender, about 6-8 minutes. Remove asparagus to a warm dish. Bring liquid to a boil and simmer uncovered until sauce is reduced by ½ about 5 minutes. Pour over asparagus and garnish w/season seeds (optional). In soup pot sauté oil and garlic for 1 minute over medium high heat. Add green onions and carrots and sauté 5-7 minutes. Then add asparagus, broth, lemon juice and salt. Reduce heat and cook until asparagus are tender about 5-7- minutes. Stir in spinach and parsley heat another 1-2 minutes. Garnish w/Swiss or parmesan cheese. Brown sausage and onion until lightly browned in frying pan over medium high heat. Drain fat. Add potatoes, water, and salt/pepper and simmer about 10 minutes. Add asparagus and simmer an additional 10 minutes or until potatoes are tender. Add extra water if needed. Place in a serving dish and sprinkle cheese over top. Cook pasta in boiling water 4 minutes. Add asparagus to boiling pasta and cook 2 minutes longer or until tender, drain. While pasta is cooking, melt butter in large frypan over medium heat. Add green onions and lemon peel, sauté 1 minute. Add lemon juice and cook until liquid is almost evaporated. In a separate bowl beat together milk and eggs. Add w/pasta and asparagus to pan w/green onions. Cook over low heat until milk mixture is slightly thick, about 4 minutes. Do not boil! Stir in dill, salt and nutmeg, serve immediately. Roast (see Asparagus tips) or steam spears until tender. Combine all other ingredients, mix well. Plate asparagus on serving platter and pour sauce over spears, serve immediately. Step 1: Cook Pasta in large sauce pan in lightly salted water Al dente. Then drain. Step 2: Meanwhile, heat olive oil in a large non-stick frying pan over high heat. Add zucchini, asparagus and garlic. Cook, stirring for 2 minutes or until vegetables start to soften. Preheat oven to 400 degrees. Wrap beets individually in foil. Roast on a rimmed baking sheet until tender, 75 minutes. When cool, rub beets with a paper towel to remove skins. Then slice. Slice large tomatoes, and halve cherry tomatoes, then arrange with beets on a platter. Top with feta, cilantro, and drizzle olive oil; season with salt and pepper. Add more liquid to help blend to desired consistency. Put the oats, milk, yogurt, chia seeds, honey and cinnamon in a small bowl and stir to combine. Slice the cantaloupe in half and remove the seeds. Divide the mixture between the carved-out cantaloupe halves (The cantaloupe becomes a bowl!). Cover, place in the fridge and let sit overnight. To serve, top with blueberries and a drizzle of honey! Instructions: Combine all ingredients in large bowl.Toss before serving and enjoy with your favorite tortilla chips. Combine flour, sugar, baking powder, salt and lemon rind in a large bowl. Stir the blackberries and blueberries into the flour mixture, coating the fruit well. Next add the milk, egg and butter, mixing just until moistened. Do not overbeat, the batter should be lumpy. In a small bowl mix the sugar, nutmeg and cinnamon together. Pour the batter into greased muffin cups and top with the sugar spice garnish. Bake in a 400 degree oven for 25 minutes. Instructions: Preheat oven to 325. In bowl mix together flour, salt, baking powder, cinnamon, and sugar. In separate bowl mix together milk, eggs whites, and applesauce. Pour wet ingredients into dry and blend completely. Add blueberries and stir. Place about 2 or 3 tablespoons of batter into each donut pan. I used Norpro 6 – Count Nonstick Donut Pan which I ordered online. Bake for approximately 12-15 minutes. In a mini food processor or blender, combine blueberries and mint simple syrup until pureed. Combine bourbon, mint simple syrup and mint blueberry puree together and shake or stir well. Pour over crushed iced and serve with extra mint leaves. 1 1/2 cups flour (or whole wheat flour) 1 cup rolled oats 1 Tbs. baking powder 1 tsp. ground cinnamon Combine in bowl. 1 egg 1 cup milk 1/4 cup honey In another bowl combine and mix well. Add wet ingredients to the dry ingredients and stir until moistened. 1 1/2 cups fresh blueberries Fold in berries. Fill well greased muffins tins 2/3 full. Sprinkle top w/cinnamon sugar. Bake in oven @ 400 for 15-20 minutes. Blueberry Salad Take your favorite greens, add chopped tomato, cucumber, red onion, carrots and anything else you might have in the frig. Toss with your favorite dressing and top with blueberries. The combination is sensational and makes a lovely presentation! Combine all of the above ingredients in a bowl. Mix well and refrigerate at least one hour before serving. Serve over our scrumptious pound cake or for a lite affair serve over Angel Food cake. Rinse berries and place on a lined baking sheet (wax or parchment paper), in a single layer. Berries can be used in recipes, as toppings or just right out of the bag. Keep in mind that frozen berries lose their firmness but not their flavor. Prepare jam jars according to package directions. Combine the crushed blueberries with lemon juice in a large pot. Gradually stir in fruit pectin. Bring to a full rolling boil over high heat, stirring constantly. Add all of the sugar, stirring to dissolve. Return to a rolling boil. Boil for one 1 minute, stirring constantly. Remove from heat and ladle hot jam into hot jars carefully, leaving ¼ inch head space. Place hot lids on jars and tighten rims on. Place filled jars into a large pot of water so that 1″ – 2″ of water covers lids. Bring water to a gentle steady boil. Place a lid on pot and boil gently for 10 minutes. Turn off heat and remove lid from pot. Let stand for 5 minutes. Carefully remove jars and place on a towel. Allow to cool undisturbed for 12 to 24 hours. After cooling, test seals by pressing the center of each lid, if a lid does not flex up and down, it is sealed! You can store jars for up to a year in a cool, dry, dark place. Enjoy!! Step 1: Heat 1 tablespoon oil in a wok over high heat until smoking. Add the kale and bok choy, season with salt, and stir-fry until the vegetables are bright green and barely wilted, about 1 minute. Transfer to a bowl and set aside. Step 2: Heat 1 more tablespoon oil in the wok over high heat until smoking. Add raw minced garlic and bird’s eye chili and cook, stirring, until fragrant, about 15 seconds. Add rice and stir immediately, breaking up any large chunks and adding remaining garlic oil as necessary to prevent sticking. Step 3: Season rice with salt and white pepper, then add soy sauce. Return kale and bok choy to rice and toss to combine. Transfer to warm serving bowl and sprinkle generously with fried garlic. Serve immediately. Press the ends of the melon, they should “give” slightly. Next, shake the melon if you “hear” or “feel” seeds rattle inside the melon is ripe and ready to eat. Coat the carrots and asparagus with olive oil and season with the rosemary, thyme, salt and pepper. Preheat the oven to 400 degrees, place the carrots on a baking sheet or aluminum foil. If you have some thicker carrots place them on the foil and place them into the oven for 15 minutes. After 15 minutes add any of the thinner carrots and the asparagus and bake for an additional 10-15 minutes until tender. If needed you can cover the carrots and asparagus with foil to prevent burning. Another option is to par boil the carrots and roast everything at once for 15 minutes. Toss all ingredients, cover and refrigerate for 30 minutes. Serve chilled, simply delicious! Preheat oven to 450 degrees. Toss tomatoes, oil, and rosemary. Sprinkle with salt and pepper to taste. Place on baking sheet and roast until tomatoes are browned on bottom – about 15 minutes. Toss with chives. Combine first 5 ingredients in a bowl. Whisk remaining three ingredients and pour over salad, salt and pepper to taste. Blend all ingredients in blender until smooth. Garnish with a sprig of mint and enjoy. Cantaloupe is an excellent source of fiber! Corn will keep for several months. To reheat, simply place in microwave safe dish or plate and heat for 2-3 minutes. Combine cucumbers, radishes, and cheese in bowl. Whisk together freshly squeezed lemon juice, vinegar, oil, dill, sugar, salt and pepper until combined. Add vinaigrette to cucumber mixture and refrigerate until you are ready to serve. Bring water and carrots to a boil. Reduce to low and cover, simmer for 10 minutes or until carrots are tender. Drain and return carrots to pan, uncovered. In a small sauce pan combine butter, honey and salt-cooking 4-5 minutes until blended. Add mixture to carrots, then stir in rum or bourbon. Return carrots to medium-high heat for 8-10 minutes, stirring until carrots are glazed and most of the liquid is evaporated. In bowl whisk together eggs, salt, pepper, and cheese. After cooking on skillet for 1-2 minutes stir in dill. When cooked spoon eggs onto bread or pita and garnish with more dill. Place eggplants onto the baking sheet and prick in several places using a fork. Broil eggplants 2 minutes on all sides. Turn broiler off, Turn on heat oven to 375 °F, and then roast eggplants until very soft; 25 -30 minutes. Cool until easily handled. medium bowl. Set aside so the flavors meld. Split the roasted eggplants, drain excess liquid, scrape out the flesh and add to the tahini mixture. (Discard excess liquid and skins). Mash eggplant into tahini mixture with a fork until somewhat smooth with some texture remaining. Cool to room temperature then stir in parsley and drizzle the top with olive oil. large zip-lock bag and shake to combine. Beat eggs in a shallow dish. Combine breadcrumbs, parmesan cheese and ¼ tsp salt, ½ tsp pepper in second shallow dish. Spread eggplant onto paper towels and press down with additional paper towels to remove as much liquid as possible. Place in zip-lock bag and toss with flour mixture, shaking off any excess flour, and dip into eggs. Then place in breadcrumb mixture, pressing down so they stick to eggplant. Drizzle olive oil onto baking sheets and spread around using a pastry brush. Place eggplant onto baking sheet and cook for 10 minutes. Flip eggplant slices, rotate baking sheets and cook an additional 10 minutes. Remove from the oven. Now comes the fun part! Use these “crisps” in salads, as a sandwich or simply coat with tomato sauce and a sprinkle of mozzarella cheese and enjoy!! Whisk lemon juice and olive oil until well blended. Add salt/pepper to taste and toss with your favorite greens. It Adds just the right touch without over powering your salad. It´s a lite and refreshing dressing for veggies as well as fruits..be creative! Strip mint leaves and add them to saucepan. Also add water and honey. Bring ingredients to a boil. Let steep for 15 minutes. Strain into a small bowl. Allow to cool completely and place in refrigerator. Just before serving place Cool Whip and strained mint syrup into a bowl and whisk together until evenly combined. Serve and enjoy. Locally harvested honey means that the honey has been produced by bees that are from the environment in which you live. It’s always best to consume foods from the area in which you live as they contain the immune stimulating properties needed for your body to adapt to its environment. People that suffer from seasonal allergies show great improvement using local honey. Buying local honey ensures that you are getting a quality, health benefiting product. Honey that is sold @ grocery stores can come from other countries and you really don’t know what has gone into the manufacturing, harvesting of the honey. Antioxidant – honey contains nutraceuticals which are effective in removing free radicals from our bodies. Weight loss – when consumed w/warm water helps in digesting the fat stored in your body. It is honey that is straight from the hive, unprocessed. It is tastier and more potent then processed honey. It provides many of the same benefits as honey. Raw honey can be used as a substitute for honey in recipes, teas etc. Bee Pollen is created from the pollen of the male stamen of flowers. Worker bees collect and transport the pollen granules back to their nest. Bee Pollen is denser in protein then any source from animals. It is a concentrated source of vitamin B complex. It’s also potent in antioxidants. As w/honey and Raw Honey, Bee pollen is a natural energy booster. Bee Pollen also helps in weight loss. The pollen acts on the hypothalamus in the brain which controls dietary drive and this leads to a felling of fullness. Bee Pollen contains lecithin which both stimulates and normalizes poor metabolism and aids in dissolution of body fats. Bee Pollen contains over 5,000 enzymes & co-enzymes, far more than is naturally present in any other food! In small sauce pan over medium-high heat, place oil, onion and garlic, cook stirring occasionally until onions are tender. Stir in remaining ingredients. Heat to boiling. Reduce heat, simmer, uncovered about 20 minutes. Brush on beef, chicken or pork during last 10 minutes of grilling. Jamming is a fabulous way to preserve the sweet taste of our delicious berries and fruit. Picked at their peak of freshness, our produce is the key ingredient to making the perfect batch of homemade jam. This is a phenomenal way to introduce children to the kitchen and cooking. Listed below are fun and easy recipes that are tried and true. Feel free to use them and let us know how your jam turns out! Go to Blueberries, strawberries, and peaches for instructions. Preheat oven to 350. Tear kale into small pieces, avoiding the tough inner stalk. Rinse and dry very well in either a spinner or towel dry. They must be completely dry. Pour olive oil over kale in bowl and toss gently. Add salt to taste and toss again. Place kale on cookie sheet evenly spaced in one layer. Place in oven for 10-15 minutes or until kale is crisp. Enjoy! Peel onions and cut crosswise into halves. Place cut-side down in shallow baking dish just large enough to hold onions in single layer. Sprinkle w/1 Tbs. water; cover w/foil and bake @ 350 for 30 mins. Combine honey, vinegar, remaining ¼ cup water, butter, paprika, coriander, salt/pepper in small bowl. Remove onions from oven and turn cut side up. Spoon half of honey mixture over onions. Bake uncovered, 15 minutes. Baste w/remaining honey mixture; bake 15 minutes more or until tender. Cut the snap peas in half. Cut the cucumbers into slices then in halves. Puree peaches, water, sugar, lemon juice, and 1/4 teaspoon salt in a blender; add more sugar to taste. Transfer to an 8-inch-square baking dish. Freeze for 2 1/2 hours, scraping with a fork every hour (mixture should be icy and fluffy). Stir in basil. Grill nectarine halves directly on grill grate that has been brushed w/vegetable oil. When grill marks appear turn and grill other side until grill marks appear. Remove from heat, allow to cool, remove skins. Chop nectarines place in a bowl and add remaining ingredients, enjoy as is or add grilled chicken or pork! from pot. Let stand for 5 minutes. Carefully remove jars and place on a towel. Allow to cool undisturbed for 12 to 24 hours. After cooling, test seals by pressing the center of each lid, if a led does not flex up and down, it is sealed! You can store jars for up to a year in a cool, dry, dark place. Enjoy!!! In the bowl of a stand mixer, cream together the butter and sugar. Add in the eggs, one at a time, mixing after each egg is added. Add in the vanilla. Mix well. Add in the sour cream and mix until well combined. Add in the dry ingredients and mix well. Gently fold in the blueberries and peaches. Line a loaf pan or spray with cooking spray. Bake for 1 hour and 15 minutes, or until the top is lightly browned. In a saucepan, combine 1 cup water and agave over medium heat until the agave has dissolved, about 1 minute. Add raspberries and peaches, and simmer, stirring occasionally, until raspberries have broken down, about 5 minutes. Prepare peaches by rinsing, peeling and chopping fruit into slices. Place on a lined baking sheet (wax or parchment paper) in a single layer. Place in freezer for one hour or until slices are individually frozen. In an 8 inch square or 9×13 inch baking pan (depending on how many peppers you have), toss peppers in olive oil and spread in an even layer in pan (no overlapping). If using garlic, simply give the papery cloves a good smash – they will be imparting their essence here, and you will remove them before serving/storing. I would use 4 garlic cloves per 10 peppers. Roast peppers for 35-40 minutes, or until completely softened and starting to turn golden brown. Cool for ten minutes before serving, or cool to room temperature and store in air tight container in the fridge, up to two weeks. Wrap pie in tin foil or freezer bag. Place in freezer for up to 3 months. Remove from freezer and allow to thaw 3-4 hours before serving. Preheat the oil and butter in a large nonstick skillet over medium heat. Add potatoes, toss to coat with oil, and place a lid on the pan. Allow the potatoes to cook covered for 10 minutes. Simply place pie in the freezer with original wrapping on. Pies can be frozen up to 3 months. Thaw pie for several hours before heating. Cover with tin foil and heat @ 375 degrees for 45 minutes. Native Americans would pop their popcorn on the cob. They would stick a skewer through the cob and hold it over an open flame. The English colonists ate popcorn at the first Thanksgiving feast in Plymouth, Massachusetts. Popcorn needs to be at about 12% moisture in order for it to pop propperly. The corn that you picked at the farm is usually about 18-20% . We reccommend that you dry the popcorn for about 7 to 10 days then do a pop-test. Break the ear in half take off about 10 kernels, Put them in a paper Sandwich bag and place them in the microwave.If they pop then you can pop the rest . If not let the popcorn dry for another few days then try again. We like try recommend popping your corn on the cob just like the native Americans did. Place the ear in a paper sandwich bag. Place it in the microwave for 3-4 minutes. When the popping starts to slow turn off the microwave so that the corn does not burn.You will come out with a bag full of popcorn and a cob full too. Popcorn can be spiced up with lots of different flavors. Try some of these. Combine popcorn and cherries in a large bowl Combine sugar, water, preserves, corn syrup, and lemon juice in a small saucepan; bring to a boil and cook, stirring constantly, until sugar dissolves Cook until mixture forms thick, “ropy” threads that drip from spoon Pour slowly over popped popcorn and mix thoroughly Spray 9 X 13″ baking dish w/cooking spray Press mixture into baking dish and cool completely before serving. Cut into squares and enjoy!! Place popcorn and nuts in large bowl To melted butter, stir in dry mustard, garlic powder and cayenne pepper Drizzle over popcorn, toss and enjoy!! Super Easy, Super Delicious and Super Fun! Bring all ingredients (except pumpkin) to a boil on a pot and simmer for 10 minutes. In the meantime, cut the top off of the pumpkin and remove seeds and pulp. 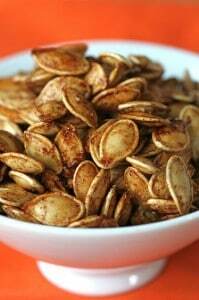 (Save the pumpkin seeds for roasting later and for planting your pumpkin patch next year!!) 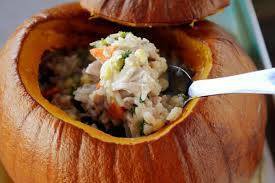 Place the pumpkin in a sturdy baking pan and fill the pumpkin w/beef mixture. Place the lid on the pumpkin and bake @ 350 degrees for 2 hours or until pumpkin is tender. Serve w/a loaf of our Corn Bread and ENJOY!!! Yummy, Healthy Snack for the whole family! Place the seeds in a bowl w/1TBS of salt, add hot water to cover. Let sit for 4 hours or overnight. Place seeds on a towel and pat them dry. Preheat oven to 400 degrees; line two baking sheets w/parchment paper. Place seeds in a large bowl, and stir in olive oil and maple syrup. Blend the remaining ingredients in a small bowl and sprinkle mixture over the seeds. Stir until sugar is dissolved, then spread seeds on the baking sheets in a thin layer. Bake for 25 minutes, rotating sheets and stirring seeds once or twice until browned and crisp. Remove seeds from the oven, sprinkle w/additional salt and enjoy! Peel and cut potatoes into 6 to 8 pieces. In large saucepan, cover potatoes w/salted water and bring to a boil. Simmer 12-15 minutes, until barely tender. Drain. Combine mustard, honey and thyme in small bowl. Pour mixture over potatoes and coat evenly. Arrange potatoes on foil-lined baking sheet, sprayed w/cooking spray. Bake @ 375 for 20 minutes or until potatoes begin to brown, season w/salt and pepper. Combine all above ingredients in a large bowl. Place in popsicle molds and freeze for at least 4 hours hours before serving. Take your favorite greens, add chopped tomato, cucumber, red onion, carrots and anything else you might have in the frig. Toss with your favorite dressing and top with blueberries. The combination is sensational and makes a lovely presentation! Toss all ingredients together until combined. Season with extra salt and pepper, if needed. Strawberries can be frozen and used throughout the year. We recommend removing stems. Then place berries on a cookie sheet to freeze. Remove Berries from freezer the next day and place them in a zip-lock bag. Now berries can be used individually or all at once. Sweet Potatoes are actually the root of plant that is in the Morning Glory family. Sweet Potatoes are an extremely nutritious food. They are high in vitamins A and C, rich in Calcium and Potassium and an excellent source of fiber. What is marketed in the US as “yams” are really a variety of Sweet Potato. A true Yam is a starchy edible root. It is rough and scaly. They are grown mainly in the Caribbean. True yams are a tropical tuber that can grow up to 6 feet in length and weigh up to 150 pounds. American “Yams” are the variety of sweet potato that has an orange flesh and is moister and sweeter then the pale yellow sweet potato. To bake sweet potatoes simply pierce the skin w/a fork and place on a baking sheet in a preheated 375 degree oven for about 45 minutes or until tender. To microwave sweet potatoes, pierce the skin w/a fork and place them a paper towel. Cook on high 5-9 minutes for 2 medium potatoes and 10-13 minutes for 4 potatoes. In a large saucepan place potatoes, cover by an inch w/cold water, add 1 TBS of salt and bring to a boil. Cook about 40 minutes or until just cooked through but not too soft. When cool, slice crosswise into 1/2-thick slices. Must be fork tender! Preheat grill to high. Brush potatoes on both sides w/canola oil and salt/pepper to taste. Grill until lightly brown on both sides about 1-2 minutes per side. Remove and place in a bowl. Brush scallions w/remaining canola oil and grill until slightly charred and softened, about 4 minutes. Slice scallions thinly and place in bowl w/potatoes. Whisk together vinegars, mustard and honey in a bowl, salt/pepper to taste. Slowly whisk in the olive oil. Pour dressing over potatoes, add parsley and gently toss. Enjoy!! Place potatoes fries on foil-lined baking sheet and toss w/olive oil. 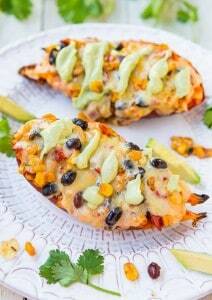 How about “Stuffed Sweet Potatoes! Super Quick, Super Easy, Super Nutritious, and Super Delicious! Serve as a main dish or side dish! Instructions: Add chard stems to saucepan of boiling water – cook for 2 minutes. Add chard leaves and corn and cook for 1 additional minute. Cook onions and garlic in dressing in nonstick skillet on medium heat for 2-3 minutes. Stir in chard mixture and cook for 2-3 additional minutes or until chard stems are tender, stirring frequently. Fun Fact: Swiss Chard is a good source of vitamins C, K, and A. It has even been established to be beneficial for patients with Alzheimer’s disease due to its high level of vitamin K.
Toast baguette slices on a baking sheet under the broiler until slightly crispy. In a saucepan, mix the balsamic vinegar and honey and heat over medium-high. Stir and let simmer. Remove from heat once the mixture has reduced by half, (15 -20 mins). Combine the feta and ricotta in a food processor or blender and process until smooth. Add ricotta or feta if necessary to reach desired consistency. Spread the whipped feta on the toasted bread and top with the finely chopped watermelon. Sprinkle with the black pepper, basil, and chives. Drizzle the reduced balsamic over the bruschetta. Place 1 squash or zucchini on a cutting board. Cut zucchini at a 45-degree angle on the bias, rotate squash a quarter turn toward you so that the cut side faces up. Cut again at a 45-degree angle right through the middle of the face. Rotate the squash a quarter turn again and repeat process. Repeat process until all squash and zucchini are cut. Transfer squash and zucchini to a large bowl. Add 1/4 cup olive oil, salt, and 1 teaspoon black pepper; toss to combine. Add Parmesan and toss until squash and zucchini are well coated. Preheat oven to 425 degrees. Fit a rimmed baking sheet with a rack; spray rack with nonstick cooking spray. Spread squash and zucchini pieces evenly on prepared rack. Transfer to oven and roast until tender and lightly caramelized, about 12 minutes, rotating pan halfway through cooking. Remove from oven and let cool slightly; transfer squash and zucchini to a large platter or 4 individual plates. Drizzle squash with remaining 2 tablespoons olive oil. Zest lemon over squash and cut lemon into wedges; squeeze lemon over squash. Season with sea salt, red pepper flakes, and black pepper; serve immediately. Preheat oven to 355 F°. Spray a 6 hole muffin tray with olive or coconut oil cooking spray, ensuring each hole is well coated. In a medium bowl, whisk beaten eggs and milk (or water) until combined. Add zucchini, parsley, cheese (if using), salt and pepper. Mix until combined. Pre heat oven to 400 degrees. Combine water, carrots, zucchini and onion in med. Sauce pan. Simmer about 4 minutes or until veggies are soft, cool slightly. Whisk together egg yolks and honey in large bowl. Stir in cooked veggies, potatoes. matzo meal. dill, salt/pepper. Gently fold in remaining egg whites. Turn mixture into well greased 9 in baking dish. Bake for 30-35 minutes or until kugel is puffed and golden brown. Can be served hot or cold. Instructions: Place onions in a pan drizzled with olive oil. Cook for several minutes then add zucchini and squash. Cook until tender. Add salt, pepper, dill, and honey. Toss and serve.